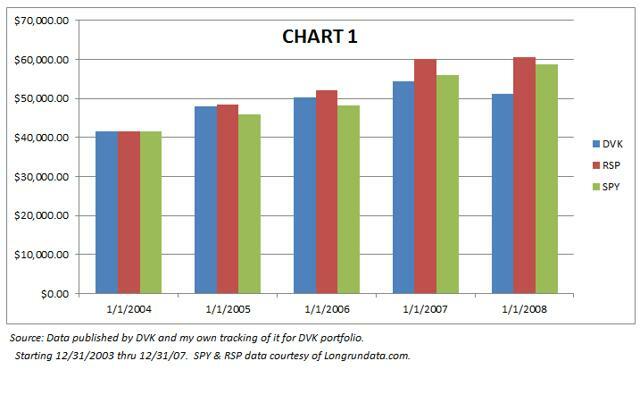 This is a 15 year history of the Dividend Stock Portfolio of David Van Knapp. The longest running portfolio that I am currently aware of managed by an individual for which no money has entered or left the portfolio. I will say up front this real-time portfolio journey is not one of an inexperienced investor, but is one that is quite common even for experienced investors. My own experience is not unlike what you will see in this real-time portfolio journey of David Van Knapp, [DVK] one of Seeking Alpha's most respected contributors as is evidenced by his over 15,000 followers. I hope this article does not detract from the many positive articles that DVK has presented to the Seeking Alpha community as that is not the purpose. The purpose is to present the facts of the longer range journey that many investors face which include changes in strategy along the way and doubts that may even creep into your psyche that there may be a better way than what you are currently doing. What I will present is a chronology of events as I have read them in published works by DVK himself, unless I indicate otherwise. In many cases I will use brackets  to indicate my own commentary. Below is a chart of data developed from the first three references at the end of this article. This will help explain the narrative that follows. The comments below allow you to see the thinking of the investor (in this case DVK) as they develop. The actual articles can be referenced by clicking on the date referenced. Nov 2nd 2006: The earliest portfolio archive available. Portfolio 2 is the Dividend Portfolio of interest here.
" Portfolio 2 has risen 60% more than S&P 500 since its inception"
"Current value of portfolio (10/31/06): $52,910 (+32%)"
"Portfolio Number 2 (the "Boring Portfolio") was begun in 2002. In 2003, it was given the specific mission of focusing on stocks with significant dividends." " Portfolio begun April 1, 2002 with $40,000"
"Portfolio has risen Portfolio 2, begun in 2002, focuses on stocks with significant dividends and dividend growth, as well as good potential to grow in price." " Since inception, this Portfolio has risen 1% more than S&P 500"
"It has provided significant dividends and has never dropped more than 10% from any value it has attained." " Since inception, this Portfolio has stayed even with the S&P 500"
" Special note: While this Portfolio 2 has "held its own" with the S&P 500 since its creation, I am not satisfied with its performance. I want to beat the market." " I will be modifying the strategy and holdings of Portfolio 2 to reflect the new research and methods." 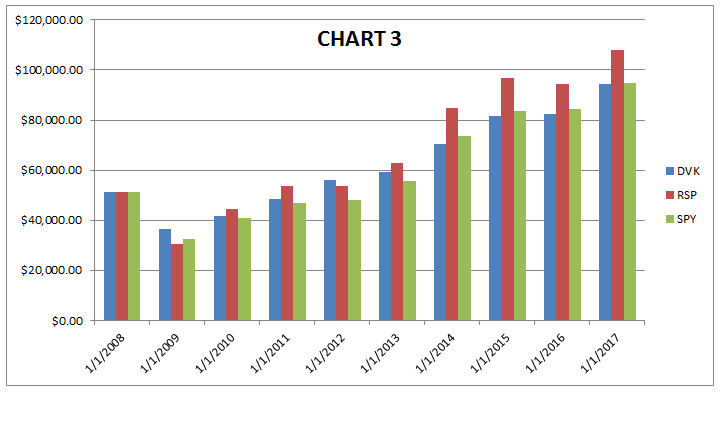 Yield based on beginning value of portfolio: 3.6%"
" Therefore, for performance-tracking, I have reset the Dividend Portfolio with a new inception date of January 1, 2008." Actual dividends should be higher, because E*Trade's "Income Estimator" does not include dividend increases until announced by each company. Yield based on original value of portfolio ($40,000): 6.1%"
Portfolio contains about 1% cash. 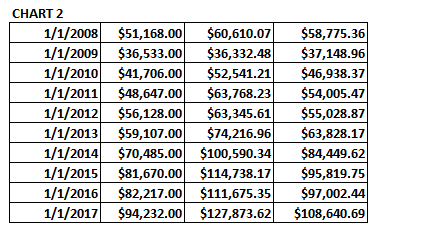 As stated earlier, I have completed the renovation "
Dividends expected over next 12 months (minimum): $2039"
on the re-inception value of $51,168." " The goal is that these yields will reach 10%within 10 years." " The Dividend Portfolio is also ahead of the S&P 500 since its creation in 2002. While it has lost 2% in total value (vs. the S&P 500's loss of 8% in the same time period), its real purpose is to generate growing dividends. 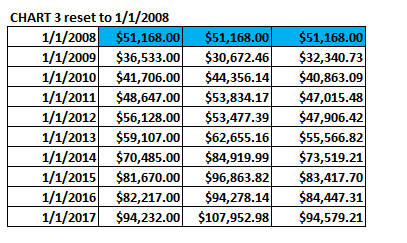 Total dividends received in 2008: $2063"
"The Dividend Portfolio is also ahead of the S&P 500 since its creation in 2002. 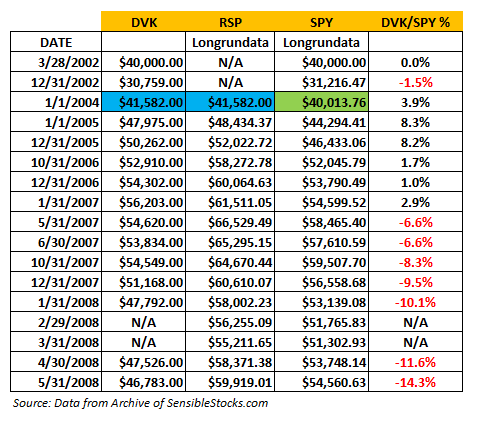 It has gained 6% in total value vs. the S&P 500's loss of 4% in the same time period. But its real purpose is to generate growing dividends. It is doing that: In 2009, the portfolio took in 19% more dividends than in 2008. Current value of portfolio (April 1, 2010): $44,671 (+12%)"
" here is the total performance of the Dividend Portfolio. It has handily beaten the S&P 500 since inception. Current value of portfolio (December 1, 2010): $47,195 (+18%)"
Current value of portfolio (February 1, 2011): $48,615 (+22%)"
Current value of portfolio (June 1, 2011): $53,124 (+33%)"
" I now consider the inception date of this portfolio to be June 1, 2008, which is when the portfolio re-construction was completed." "Origination date: June 1, 2008: $46,783"
" Yield on cost: 4.5%. This is the projected yield on the original amount in the account when it was converted to a dividend-growth portfolio on June 1, 2008. That amount was $46,783." To that end I have created a more continuous view starting Jan 1st 2004 and broke it into two pieces, one to the end of 2007, and the second a continuation to the end of 2016. Below is the data and the charts. The index I have added to the above data is the Guggenheim S&P 500 Equal Weight ETF (NYSEARCA:RSP). I believe along with others that an equal weight market index provides a more realistic index for standard portfolios in which the portfolio owners attempt some form of equal weighting themselves. As James Cloonan, founder and chairman of AAII points out in his latest book "Investing at Level3," cap-weighted indexes underweight the stocks most likely to provide the higher returns, namely small-cap and value stocks. As a result they underperform equally weighted indexes [and to some extent equally weighted portfolios.] It is therefore, and has been for some time, my opinion that when comparing your portfolio to a cap-weighted S&P500 index you have a 1-3% annualized advantage right out of the gate, even without showing any stock picking ability at all. So if you can't at least maintain an improving "gap" to the S&P500 during your accumulation years you are wasting a lot of time and money, which could be improved by using simpler investing techniques. Cloonan explains one such technique in his book, which I may expand on at a later date, but it essentially amounts to investing in RSP as a base for improved returns over the standard market average. This blog is in no way to condemn other investing methods, it is more just an educational journey to see, if held on equal footing, these market experts are correct in that it is very hard to obtain a long-term advantage in the market, especially when comparing it to an equally weighted index. If you somehow come up with an advantage, the market is not without intelligence and will quickly discount or correct for any inefficiencies. 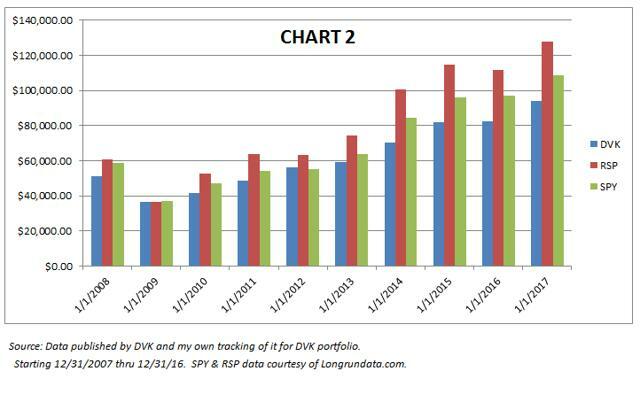 The only current portfolio that is static in nature, with more than a few years of history, is the one reported on by David Van Knapp [DVK]. This is merely a chore to compare this one static dividend growth philosophy to other more traditional index portfolios. The DVK account is not an account that is being used for retirement, so the internal income generated is of little consequence. The metric of choice in this account in order to be able to compare it to other accounts and indexes is the total return, or more specifically the dollar value of the account. The results of these comparisons were shown above along with a history of the changing thought process over 15 years of investing. My only conclusion is that over 15 years of investing, or more, an investor engaged in active management of a stock portfolio is likely to change strategies a number of times, always looking for something better. Like many investors they may also not have a good grasp even of what their portfolio performance is, especially if they are adding new money to the mix regularly. Not the case in this example, but that is why my opinion is (as well as seasoned stock pickers like Jim Cramer) that you must have a well-established core investment of a market index fund before ever attempting a learning curve of individual stock investment. Disclosure: I am/we are long RSP, GE, O.